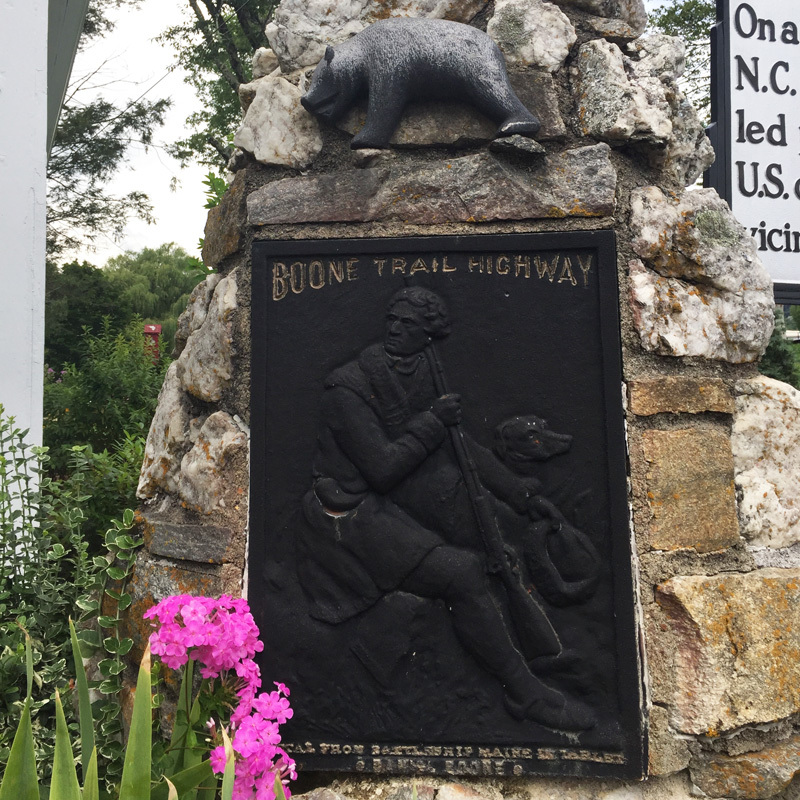 This Boone Trail Highway maker is in the form of a pyramid made of local stone and masonry with a Style-3 Boone Highway tablet and a cast metal bear above. The steel Style-3 tablet was primarily used between 1927 and 1938 and is distinguished by the BOONE TRAIL HIGHWAY caption being slightly curved. It holds an image in relief taken from Alonzo Chapel’s 1861 illustration of Boone and his hunting dog. 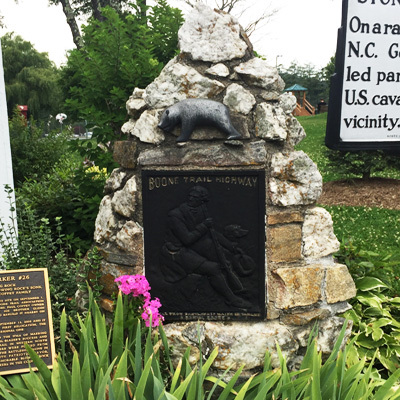 The Boone tablet is original but the Bear sculpture is a recast from the original that is in private possession. This Boone Highway marker has been moved several times. Its most recent move was in 2006. At that time a bronze plaque on a metal pole describing the history of this marker was placed next to it. This plaque says the original marker was placed on September 1, 1927. 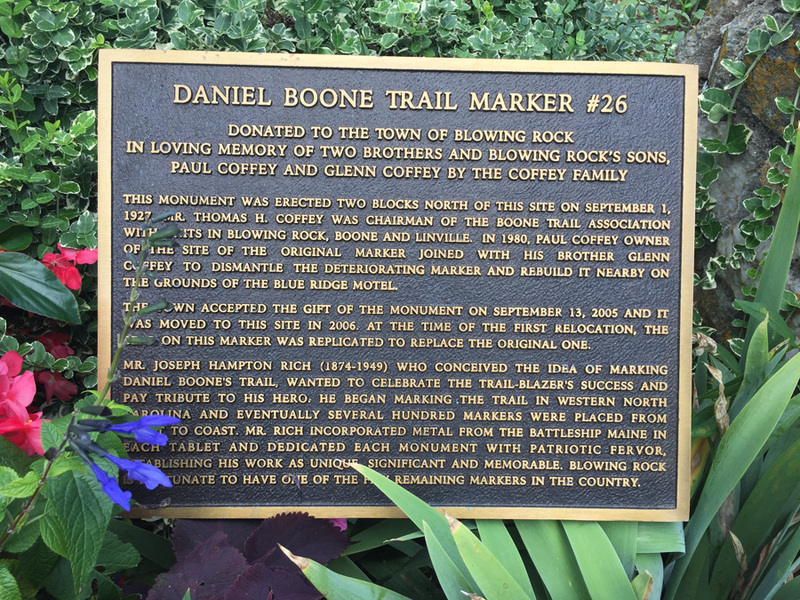 This date was actually when the Blowing Rock Chapter of the Boone Trail Highway and Memorial Association was formed according to newspaper reports from the time. An article in The Watauga Democrat from September 8, 1927 states that the Boone plaque had not arrived and the excepted arrival date was not known. It is uncertain when the marker was constructed but it was not dedicated until August 4, 1932, the same day as a now removed marker at Appalachian State University (then the Appalachian State Teachers College). This Boone Highway marker was numbered 26 by Everett G. Marshall. His interest and research of the markers led to the book, Rich Man, Daniel Boone. The numbering system was simply the order in which he found or became aware of a marker. THIS MONUMENT WAS ERECTED TWO BLOCKS NORTH OF THIS SITE ON SEPTEMBER 1, / 1927. MR. THOMAS J. COFFEE WAS CHAIRMAN OF THE BOONE TRAIL ASSOCIATION / WITH UNITS IN BLOWING ROCK, BOONE AND LINVILLE. IN 1980, PAUL COFFEE OWNER / OF THE SITE OF THE ORIGINAL MARKER JOINED WITH HIS BROTHER GLEN / COFFEE TO DISMANTLE THE DETERIORATING MARKER AND REBUILD IT NEARBY ON / THE GROUNDS OF THE BLUE RIDGE HOTEL. THE TOWN ACCEPTED THE GIFT OF THE MONUMENT ON SEPTEMBER 13, 2005 AND IT / WAS MOVED TO THIS SITE IN 2006. AT THE TIME OF THE FIRST RELOCATION, THE / THE BEAR ON THIS MARKER WAS REPLICATED TO REPLACE THE ORIGINAL ONE. MR. JOSEPH HAMPTON RICH (1874-1949) WHO CONCEIVED THE IDEA OF MARKING / DANIEL BOONE’S TRAIL, WANTED TO CELEBRATE THE TRAIL-BLAZER’S SUCCESS AND / PAY TRIBUTE TO THE HERO. HE BEGAN MARKING THE TRAIL IN WESTERN NORTH / CAROLINA AND EVENTUALLY SEVERAL HUNDRED MARKERS WERE PLACED FROM / COAST TO COAST. MR. RICH INCORPORATED METAL FROM THE BATTLESHIP MAINE IN / EACH TABLET AND DEDICATED EACH MONUMENT WITH PATRIOTIC FEVOR, / ESTABLISHING HIS WORK AS UNIQUE, SIGNIFICANT AND MEMORABLE. 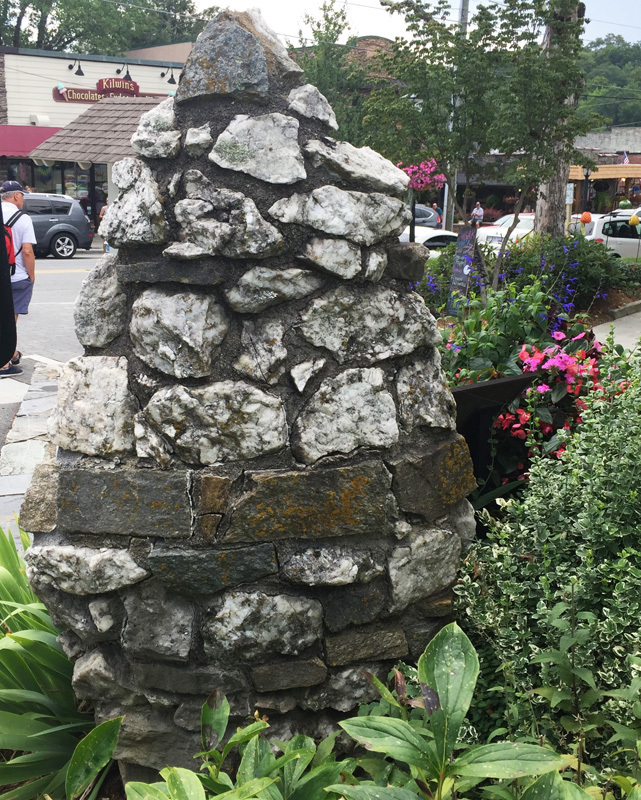 BLOWING ROCK / IS FORTUNATE TO HAVE ONE OF THE FEW REMAINING MARKERS IN THE COUNTRY. The 1932 dedication took place in the evening with a background formed by 18 boys holding torches and 48 girls holding flags. R.O. Everett of Durham delivered a speech on Sequoyah, famous as creator of the Cherokee syllabary. J. Hampton Rich was a well-known figure in North Carolina’s “Good Roads Movement” during the early 20th Century when public pressure was used to force enhancements in the public highway system. Attaining minor celebrity status, he eventually extended his vision beyond the borders of his home state. Using the legacy of Daniel Boone as a hook, he first began to cross North Carolina and then the United States drumming up support for commemorative highway markers. Between 1917 and 1938 Rich was one of the most prolific commemorators in the United States. He claimed responsibility for hundreds of markers, some in places that had no connection to Boone at all like Washington, D.C.; Boston, Massachusetts; Pike’s Peak, Colorado and at the Golden Gate Bridge in San Francisco. Rich was born in 1874 on land where the family of Daniel Boone may have once lived. What is certain though is that Daniel Boone spent many of his 21 years in North Carolina living in the area near Mocksville in Davie County and surely Riches’ lifelong passion for Boone was influenced by his immersion in local lore surrounding the famous frontiersman. Rich, who became a well-known newspaper man in Winston-Salem, also developed a passion for good highways in the state. Very likely taking a lead from a series of markers to Boone placed by the Daughters of the American Revolution beginning in 1912, Rich combined his two passions and came to the idea of capitalizing on the pioneer’s fame as a way to encourage the building of better roads. In 1913 Rich established the Boone Trail Highway and Memorial Association with the chief purpose to raise awareness of the need for better roads in North Carolina. Rich also wanted to educate the public about the history and heritage of the pioneer era and promote patriotism. 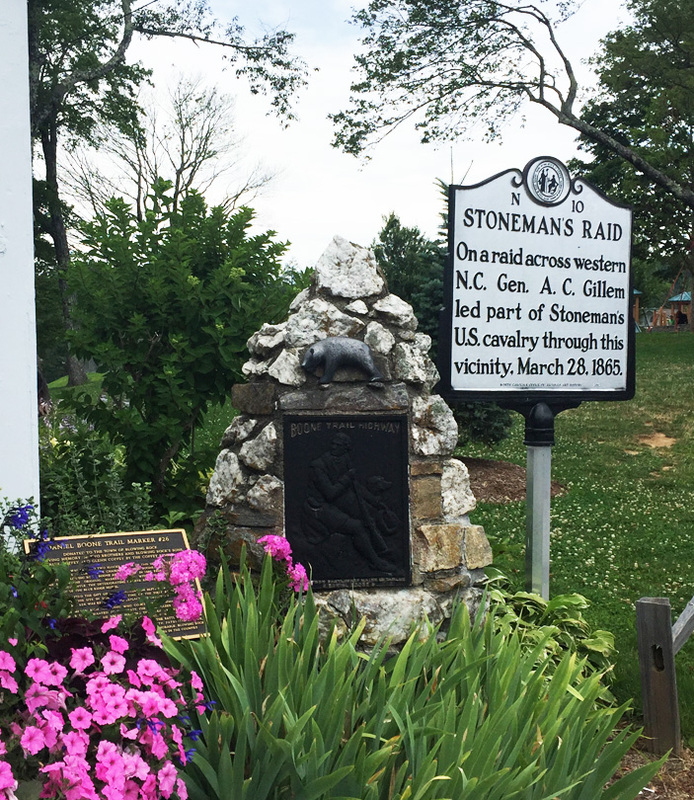 Beginning with the first documented marker, placed at East Bend in Yadkin County in 1917, Rich claimed to have placed about 360 tablets across the United States by 1938. Of that number, (which came from Rich) less than 60 originals are still known to exist and it may be impossible to ever know how many were actually incorporated into a highway memorial. Although it is known that he sold some in the early years Riches method of operation was typically to give a tablet, sometimes multiple tablets, to a community with their promise to raise funds to erect the highway marker. In some cases it was years before a marker was ever constructed and it is almost certain that many markers were never completed. The number of markers with documented proof of being completed is less than 150. As more digitally preserved newspapers from the period become available this number will likely increase. Each tablet with the image of Daniel Boone includes wording that it contains metal from the Battleship USS Maine sunk in Havana harbor in 1898 at the outset of the Spanish-American War. In 1916 with the help of then Secretary of the Navy, Josephus Daniels, Rich had acquired 300 pounds of metal salvaged from the ship. It is questionable that each plaque actually contained some of this metal. In a 1948 article from “The Daily Tar Heel” Rich is quoted as saying “the first tablets contained…metal from the battleship.” In addition to those featuring Daniel Boone, Rich also created tablets featuring “Cherokee Chief Sequoia” and a bison in an effort to mark ancient buffalo traces used by Native American and then Colonial settlers from the coast at Wilmington through the Great Smoky Mountains in the west. Very few of these were produced and few examples remain. Other efforts include tablets to Abraham Lincoln and possibly Davey Crockett. Regardless of the image on the tablet, these are lumped together under the heading of Boone Trail Highway and Memorial Association markers. The best current resource is Rich Man: Daniel Boone by Gary Marshall. His research efforts and the book’s publication in 2003 generated interest in finding and protecting the remaining markers. The marker is on Main Street (Business U.S. 321) near Sunset Drive, in Blowing Rock, NC on the right when traveling south. It is to the right of a small white wood frame building that holds the Blowing Rock Museum. Blowing Rock City Park starts right to the right of the memorial marker. 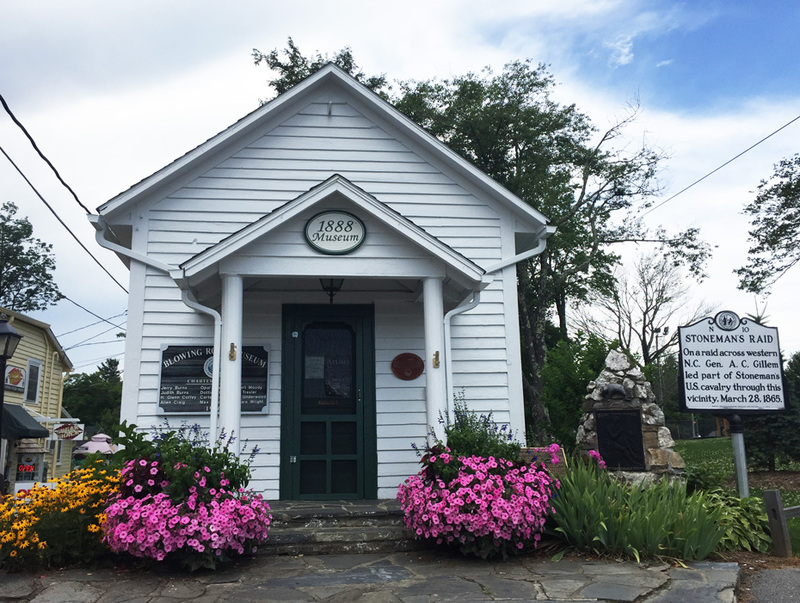 The marker was originally located at what is now the Speckled Trout Café on the edge of downtown Blowing Rock, NC. In 1980 it was moved to the grounds of the Blue Ridge Hotel at 830 N. Main Street. It was placed at the present location in 2006.